We asked moms to use the Reading Kingdom with their kids over the summer and let us know what they think of the program. Maureen from Simply Stacie had this to say about The Reading Kingdom online learning program. Reading Kingdom has been very effective with my son because it is a customized program that is able to adapt to his particular needs based on previous interactions. Adam started by taking a Skills Assessment which identified his abilities in pre-reading, reading and writing. Once his skills were assessed it started him at the appropriate level so that he was challenged but not overly frustrated with material that was either too limited or advanced. Reading Kingdom is designed to promote his strengths while helping him overcome any weaknesses. Reading Kingdom is designed to promote his strengths while helping him overcome any weaknesses. I appreciate that this tutoring technique really boosts his confidence and makes him eager to continue his daily lessons….I have observed Adam thoroughly engaged in the program and he is motivated to master each level which gives him a great sense of pride in his abilities. He particularly likes “earning” books as a reward for completing a lesson….After using this program for several weeks, I have noticed that Adam’s confidence is much improved when reading independently and in fact, he recently read his first level 2 book by himself….we were both overjoyed and filled with pride! Are you ready to try the Reading Kingdom online reading program? 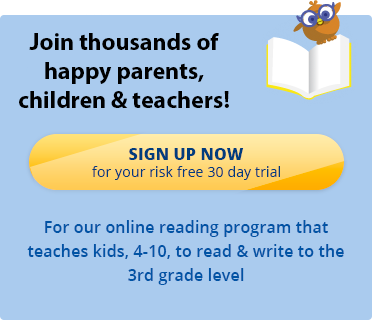 Sign up for a free trial of this amazing online reading program here.